There are times when we need to do something more with our webpages then just to read them. For example save the information and or send it to someone or even print it right? Save as option saves the page and all the related resources in an additional folder. So it is better to save it as an image or even a PDF for better experience. For example you booked an E-Ticket and you want to bring a soft copy with you somewhere (may be to print or simply to forward to someone). Saving as image is the best option because it makes you to save it as is without worrying much. It also severs as an aid when you want to raise an issue to someone and want to show them the referene. Especially web designers and web developers encounter with such stuff more often, but it is not limited to them. Another easy alternate is if you can save the webpage as a PDF file for hassle free print (or to carry) purpose. The boon to us is the “PRINT SCREEN” key on the keyboard which let us save the stuff being displayed on the screen. In case of webpage it might not be very useful in many cases because the webpages are much lenghy then the screen (especially in height – more than width). There are several browser Add-Ons which can be helpful to you in such circumstances. There is a PRO version also available for the plug-in, but rather go for the Free version and you will get most of your need. The plug in also provides version for Microsoft Internet Explorer, but works best with FireFox. when you update the FireFox browser to its latest version the plug in may or may not work (eg. for FF 12 as of now, wait… last minute update… the version seems available as of now). So when upgrading the browser, it is better to check compatibility of the the plug-ins you use and essential for you; with the new version you are about to install. The FireShot results for pages with multiple frames may not output as expected. 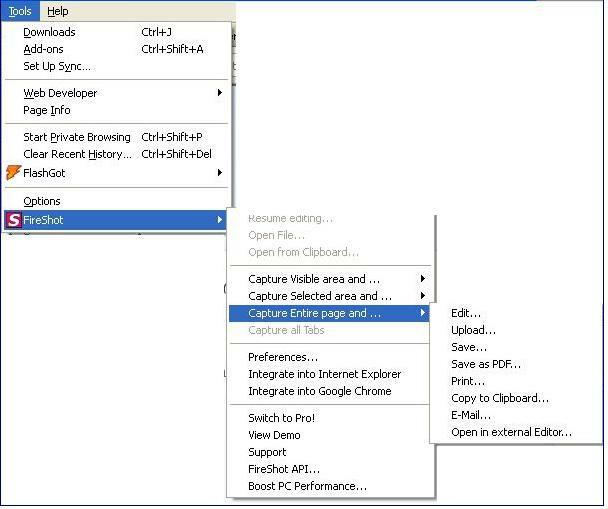 Save as PDF option saves the content as image in PDF file, so it is not a Text PDF and hence not editable in that matter. We look forward to here your experiences with the same and do not hesitate to mention any other cool browser plugin you came across and you like to share with others. Adobe announce “No Flash Player Support” for Android 4.0 devices | Tech News Mozilla MarketPlace is Open by Invitation Now | News Get The FavIcon For Any Website | Interesting Stuff How To Take Screenshot of Entire Page from Firefox?